Bad news for completionists and achievement hunters, good news for gamers who like having their choices matter. In an interview with Only SP, The Witcher 3: The Wild Hunt's gameplay producer Marek Ziemak talked about multiple endings, load times, returning voice actors and differences between platforms. The Witcher is known for being a very choice-driven series, for example, in The Witcher 2, the second act of the game was completely different depending on a choice you made in the first act. 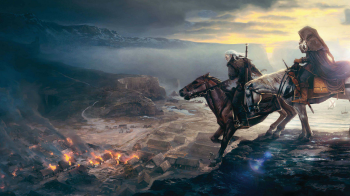 The Witcher 3 aims to continue this tradition by having 36 alternate endings. Ziemak said the goal of The Witcher 3 is to bring closure to Geralt's story, so it's nice to know that the story's end will be about your Geralt, not just the Geralt. As for loading times? Well, there are none. "Thanks to new technology on RedEngine3, we were actually able to create a world without loading screens as you travel across the world," said Ziemak. When pointed out that the demo of the game shown at E3 suffered from some framerate issues, Ziemak assured us that "We didn't have everything fully optimized," and it will be fixed for the retail game. For those of you who've gotten used to hearing Doug Cockle's gruff and gritty Geralt and John Schwab's soothing and well-spoken Dandelion, rest assured that the vast majority of voice actors from the previous games will be reprising their roles. As for the console versions, Ziemak assures us that they are not merely "ports" of the PC version. "We're not actually porting the game. We were doing it multi-platform since the very beginning." He says the team's target is to release all three versions (PC, PS4, Xbox One) at the same time. Lastly, a bit of good news for people like me who got thoroughly fed up with having to manually run Geralt from place to place in previous games. Quick travel is coming to The Witcher 3, and you'll be able to instantly warp to any location you've already visited!